The excerpt below is from the book “Passionate Learners: Giving Our Classrooms Back to Our Students,” by Pernille Ripp. This excerpt is from the chapter entitled “When Change Happens to Good Teachers." Four years ago, I realized that I needed to take responsibility for the damage I had done to students who came into my room loving (or at least liking) school and left diminished in some ways. Those kids who loved math until my long-winded lectures about process left them confused and bitter. Those kids that loved to read until my strict book report guidelines and reading logs devoured their curiosity for great stories. I had to take responsibility for what I had done. There was no one else to blame. Just as important, I had to make sure that my future students would leave our classroom still loving school, with passionate curiosity, not afraid to try something new. How do we make children hate school so much? I now teach 5th grade, and by the time they reach me, certain subjects have already landed on their top 10 list of most dreadful things to do. Math tends to top the chart, but social studies usually is close behind, and some even hate reading (but may read many books outside of school). Most students confess a love of recess, art, music, and sometimes even science. PE is always a crowd favorite as well. But math and social studies, yikes. I never marry an idea; I date it. Year after year my ideas should evolve to match my growing understanding and experience. I don’t blame the students. The system of school has taught them to feel this way. How dare I say this? Because I was that system. I think about math and how I taught it: drill and kill, lecture and lecture some more. Show them repeatedly how to do a problem, then have one or two students come up and work through a similar problem while the rest of the class watches (eyes glazing over). And finally have them practice it on their own, usually through homework. In my straight-edged classroom, students were not allowed to work ahead — they needed to pay attention to me slogging through all of the pages. We did not have much time for discussion, let alone any further exploration. Substitute social studies for math in the paragraph above, leave out the problems at the board, and you have a pretty good summary of what my social studies class looked like as well. By the time I was done teaching, my students were good at putting their names on worksheets, filling them out, and following along in the textbook. Too bad about their curiosity. We just didn't have time for that. So I changed. And if you want to change but haven't tried yet, take my word for it — you can too. I'm not that special; lots of teachers are changing the way they teach and how school is done. Many did not wait for permission but transformed on their own. If you would like someone’s permission, you hereby have mine. Go ahead – start to create your own classroom of passionate learners. I will admit that not every kid leaves my classroom having fallen back in love with school. Sometimes that damage takes years to undo. But I mostly get them back on the path of loving learning. I take responsibility for my own actions as a teacher and realize the damage I can do. I go to school knowing that every day I can be the difference between a child embracing his or her own learning or tuning out. I accept that what I do today may make the difference a few years from now between staying in school or dropping out. I believed that there was one way to do school to kids. Now I know that school needs to change, and we have to change it from within. Part of that change needs to be about including the voices of our students. School can no longer just be done to our kids, they must experience it and own it. When I first started on this journey of changing the way I teach, I did not know where my path would ultimately lead. I still don’t. With every child that enters my classroom, and with every parent that comes along with something to share, that path changes and so must I.
I set out to give the classroom back to the students, and this remains my mission, yet I have not accomplished all of the goals I set for myself. With any change there comes resistance, and I have met my fair share. Students who did not understand why they couldn’t just be told how to do something. Parents who felt I didn't give enough homework or enough grades. Teachers who thought I wasn't doing a good enough job preparing the kids. My own doubt sneaking in whenever an idea did not work. Yet, if we want to make change, we must expect to fight for what we believe in – even with ourselves sometimes. There are ways that we can change our school system from within, even though many policy makers may seem to work against us. The one question from teachers I seem to get the most is this: How do you change? The answer for me has always been: start where you are. Once you embrace the idea that there has to be something better, you are on your way. Take stock of what makes you tick and what makes you stop. What burns you out and what do you have power over? There are many things that wear my soul down that I cannot control. So I try to focus on the things I can make decisions about. What is in my control? Homework, grades, punishment, the ways information is presented, the community building, the shared ownership. Then I focus on the few things that I feel ready to change right now. I never marry an idea; I date it. Year after year my ideas should evolve to match my growing understanding and experience. I won't get stuck. I just need to stay focused on my ultimate purpose: to have students love school. Change may always be a constant, and I am at peace with that. Pernille Ripp teaches 7th graders in Wisconsin and has taught 4th and 5th grade as well. She is the creator of the Global Read Aloud Project, a co-founder of EdCamp MadWI and writes at Blogging through the Fourth Dimension. 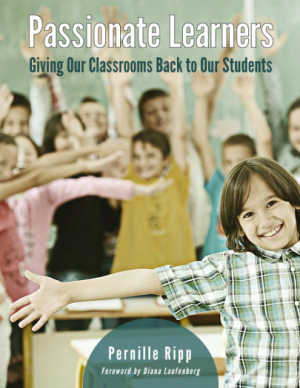 Her first book Passionate Learners: Giving Our Classrooms Back to Our Students is available from Powerful Learning Press. Her second book, Empowered Schools, Empowered Students – Creating Connected and Invested Learners, has just been published by Corwin Press. Follow her on Twitter @PernilleRipp.